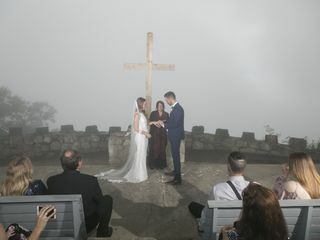 We could not have chosen a better officiant than Ronesa! She was so helpful and accommodating, truly went beyond our expectations. 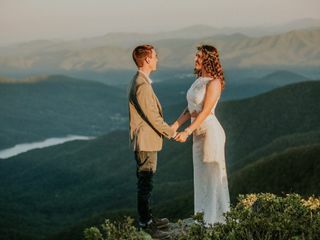 From helping us decide on a venue and a plan B, to keeping a day open for us in case of bad weather, she even hiked up to Craggy Pinnacle with us! She was very quick to respond and kept us up to date on all weather conditions and road closures. We eloped from Florida to North Carolina with our parents, and the day could not have been any more special! She put so much love into our ceremony and made everything very smooth and easy for us. We are so grateful to have shared our day with someone who shares our ethical values as well! Thank you so much for helping make our day perfect, Ronesa! We were an older couple who reunited after 46 years. We decided we wanted to get married on the deck of our new mountain house with just a few weeks to plan it all. She was prompt, very helpful, supportive, and endearing. She was in tears with us as we shared our past experience and the story of my bracelet that John had given me for Christmas 1969 and I was wearing for our wedding day 11/3/2018. 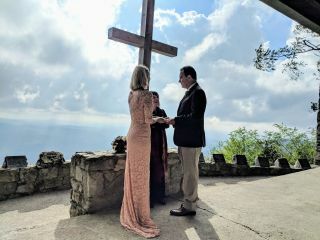 Reverend Ronesa helped to make our fairytale mountaintop wedding even more special! From our very first contact, it was obvious that she would strive to make our wedding exactly what we wanted it to be. She was very helpful in giving us sample services to go by, and totally open to how we wanted to individualize our service. She was also great about staying in contact. I never had a moment of worry about her reliability. If you are looking for a pastor who truly cares, she is the one for you. Her spirit shines through, and she is professional as well! Ronesa was very professional, easy to work with and extremely accommodating. I would recommend using her services. You will be pleased. Reverend Ronesa Rosewood is a genuinely caring professional. She was quick at responding to all my emails and I can’t thank her enough with how helpful she had been throughout the entire wedding planning process. She created a beautiful wedding ceremony for us and I love every word of it. Thank you for officiating our wedding on July 31st! I absolutely cannot recommend Ronesa highly enough! We interviewed two officiants who we were both very disappointed with before we were recommended to Ronesa by our wedding coordinator. We felt an instant connection and positivity from this wonderful woman when doing a Skype call with her. She listened to us and was very understanding and supportive of our unconventional wedding ceremony. She allowed us to take the reins with what we wanted and only made minor suggestions and did not attempt to alter our original wants and needs from our ceremony. She had a deep peace about her and honored our wishes without judgment. 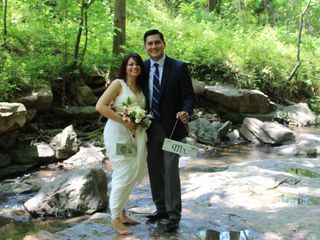 Overall, she made the process so easy and stress-free, and during our wedding, she was an absolute joy as she trekked to our location in the middle of a river and delivered what my husband and I both felt was a flawless ceremony. We both felt that she was the star of our wedding day and we couldn’t imagine having gotten married without her. Thank you Ronesa!!!! Very professional but at the same time very friendly and helpful, worked well with the wedding planner and with us....highly recommended. She did a great job! She helped us personalize our ceremony and responded promptly to any correspondence . We were very pleased with the service. Rev. Ronesa was amazing to deal with and we were very pleased with our ceremony. Thank you so much Rev Ronesa and God Bless. Our marriage met our expectations and we couldn't be happier. Rev. Ronesa helped us a lot with her patience in the process. She responded quickly every consultations for us and she got we were feeling relaxed in our ceremony. Thank you Rev. Ronesa for being with us in this special moment. Our wedding ceremony turned out better than I could imagine. Ronesa provided us with a lot of options to customize our ceremony to something unique and meaningful. She was very open to all our ideas and had great opinions on improvements. I especially liked how we were able to include our children in the ceremony. Everyone that attended said it was one of the most beautiful ceremonies they'd ever attended and there was hardly a dry eye in the house. I don't think we could have come up with such a beautiful ceremony without her guidance. We loved Ronesa, she was so sweet and responded back very quickly. She worked to make our ceremony truly ours. Ronesa was very kind and attentive to us. She spent a lot of time researching ceremonies to best suit our needs and style. She's very genuine! 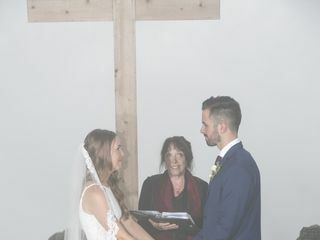 When looking for an officiant for our wedding, my husband and I wanted someone who had the same belief system as us and would let us do our ceremony the way we wanted. We were insanely lucky to come across Ronesa! She is so easy to work with and seemed genuinely thrilled to be a part of our wedding. During a phone call with her, I was impressed by how worldly and spiritual she was, and not to mention her big heart. I really enjoyed getting to know her a little bit before the wedding day. When it came to planning the ceremony, she was fantastic! She really walked me through it by sending me an outline and then a ton of readings, vows, and blessings. She really listened to what I was looking for a in a ceremony and made the planning very simple for me. She was also open to using any kind of reading that I found on my own, but she definitely has a great selection (aside from our vows, every reading/blessing we used was from her library). On the day of the wedding, she was wonderful, friendly, and everything I wanted in an officiant. Afterwards, we had SO many compliments from our guests on Ronesa and the ceremony. I give her so much credit in really helping make our ceremony about us and making it enjoyable for our guests. At the end of the whole night, Dave and I agreed that the ceremony was the most memorable part of our day. Thank you, Ronesa!!! Ronessa worked with us remotely to create a completely custom ceremony for our private wedding. She was so communicative and easy to work with, even remotely, that when we finally met her face-to-face, she already felt like an old friend. Our ceremony was perfect. We couldn't be happier. Ronessa is wonderful! Irina and I threw together a wonder celebration, at the last minute, with the help and direction of Rev Ronesa. Her input was timely, and invaluable. (In fact, I reached out to her a few days before the ceremony, though I don't suggest that.) The ceremony was wonderful--a memory we will cherish for a lifetime. Please consider meeting with Ronesa in person. She exudes warmth and caring, and is so enthusiastic about making your ceremony just right for you. In the last few hours, we changed the ceremony wording 3 times, trying to keep up with Asheville's changing weather! Ronesa was right there for us the entire time. A lovely person! Ronesa is absolutely awesome!! I suggest her for you wedding....she was very sweet, friendly and professional. Not only did Rev. Ronesa help us pull together a ceremony that was beautifully written and fitting to our relationship, she willingly hiked about half a mile with us through mud, steams, fallen branches, etc. 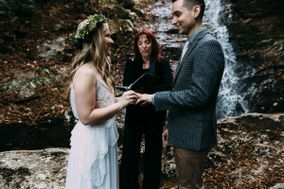 to get to the location of our ceremony (in front of a waterfall in the Pisgah National Forest). We are so thankful that she was willing to stick around while we took photos with our photographers for a couple of hours. This is definitely not something she had to do — but without her flexibility we wouldn't have the pictures we have today! 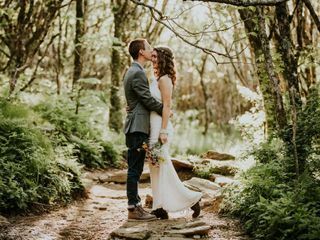 If you're looking for an officiant, especially for an adventure elopement ceremony, we highly recommend Rev. Ronesa! From the moment we had our first conversation Ms. Rosewood wow'ed me with her kindness, her ability to adjust to my needs and understand them, her experience and just her way of making me feel comfortable and assured. I seriously cannot say enough about this woman and the wonderful experience she gave us. Ms. Rosewood was prompt with responses, insightful and more than accomadating. She will definitely be there when we renew our vows! I'm writing this review years later because I think of Ronesa when I think of how perfect my wedding day was. I will never forget how integral she was to the happiest day of my life.